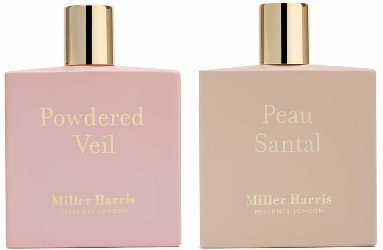 British niche line Miller Harris has launched two new fragrances, Powdered Veil and Peau Santal. Powdered Veil ~ "As the name suggests, this is a modern and transparent take on amber, wrapped in a veil of cashmere and florals. The fragrance suggests the instantly evocative scent powder puffs, old compacts and quiet, retro glamour. Delicately powdery and sweetly resinous, amber is the definitive oriental accord and, in Powdered Veil, it is given a nuanced and translucent air. The sparkling freshness of spicy pink pepper flirts with a twist of rosy geranium. A sensuous orchid accord provides a fragile and haunting floralcy to the heart, combined with transparent florals and the luminous freshness of hedione. A rich and radiant lasting impression of soft powder is created through the combination of amber, vanilla bourbon and musk, where a sensual and animalic vibration of labdanum combines with sandalwood to create intimacy and warmth." Additional notes include rhubarb, patchouli and cashmeran. Peau Santal ~ "The sensation of soft, warm skin evoked by the creamy richness of sandalwood. Exceptionally smooth and sensual, sandalwood is the most noble of woods, and, in Peau Santal, Miller Harris have enriched every aspect of the material to create the ultimate skin-scent. The fresh and bright elements of the wood are lifted with airy pink pepper and the sweet spice of saffron. Olibanum and papyrus enhance the delicate resinous quality and rich warmth of this precious wood. Cashmere woods, crisp amber and moss create a hint of dry sensuality, whilst a lick of vanilla co2 rounds out the scent, playing to the creamy and slightly carnal quality of sandalwood." Additional notes include bergamot and violet leaf. Miller Harris Powdered Veil and Peau Santal are available now at World Duty Free, in 50 or 100 ml Eau de Parfum. They will go into wider distribution in September.